To get the data from Google Spreadsheets to your application you can follow these steps. Step 1. Go to the File menu and select "Download As". This will open a sub-menu with various formats. I used Excel. Step 2: The file will then open in the application you selected. Click column A to highlight all Symbols in the watch list. Right click to bring up the function menu. Select "Copy" and all of the symbols will be stored in your clipboard. 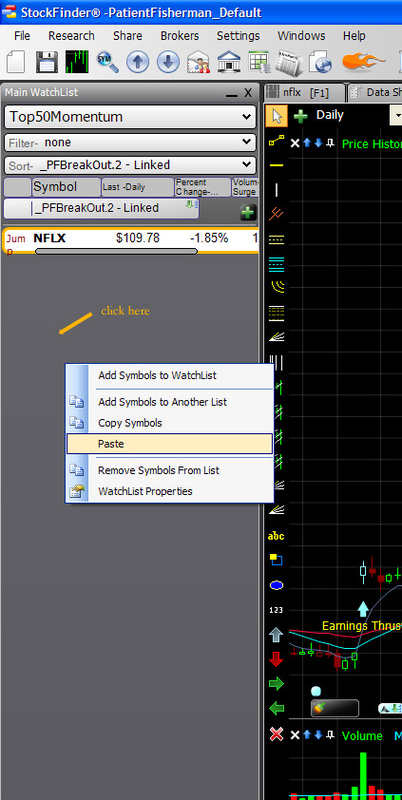 In the case of StockFinder, right click in the blank part of the watch list pane and select Paste from the drop down. No Response to "Copying the spreadsheet"